My children are in their twenties now, starting their own families or seriously considering it, and so they ask me for any pearls of wisdom I may have about being a mother. They also scrutinize my parenting style with that enthusiastic commitment of not making the same mistakes my parents did! My oldest daughter decided that part of our Thanksgiving holiday fun would be to read aloud the book “Letting Go Of Anger” that we bought at the library book sale. She loved the book, because it identified anger styles that made sense. She quickly identified her own anger style, which started out as easy fun facts, but then she moved on to friends and family and then of course, me. At this point, my husband perked up taking off his headphones where he had been doing some recreational computer programming. My daughter began to read aloud my anger style or actually several styles, while my husband enthusiastically nodded and chimed in with supportive examples. Nothing like a little holiday spirit and family fun to raise a person’s sense of self-awareness! I had to admit though, this book was helpful. This book gave me greater insight into how my anger style negatively affects others – and it affirmed my daughter’s feelings and frustration in dealing with me. It helped her recognize her own anger style as well, and she tells me she is able to recognize the physical signs of anger much sooner. The problem I think we all have with anger is we don’t see when we are becoming angry early enough. This book can really help you take a detour before you lose your cool, because it helps you recognize your unconscious habits with anger. I was happy to have the chance to connect with Ron Efron, PhD about the book he and his wife wrote. Robbyn: Many parents want to choose alternatives to punishing and spanking, and may even know what some of those alternatives are, but in the moment feel too angry to cope with the situation in the way they know is best. Dr. Efron, how can parents better control their anger? As parents, we FIRST need to recognize our triggers. Many parents have decided they want to quit spanking their children. Unfortunately, good intent sometimes isn’t strong enough to control immediate feelings of anger and frustration. Try as you might, after the tenth time (which feels like the ten thousandth) in a row, 4 year old Jessica forgets to get dressed so you can make it to pre-school on time; or when 6 year old Marty stomps up to his bedroom without warning, yelling that you’re the worst excuse of a parent in the whole world because you insist he pick up his room before playing games on his computer; or when 8 year old Sheila picks and picks at the meal you just spent forever preparing – and then says she likes spaghetti better the way grandma makes it – and you blow up! Robbyn: I think most parents can relate to this! My granddaughter will cry to her mom, “I’m telling grandma,” which really frustrates my poor daughter because then she feels that I’m over her shoulder judging her every move. This just raises her frustration level! Then you say things you really don’t mean. It makes matters worse and starts Jessica pouting, Marty cursing, and Sheila crying — exactly the trigger behaviors that drive you nuts. Then comes the urge to punish, too often including physical aggression. And then comes regret, sometimes only seconds later but still far too late to undo the damage you’ve done. Now parents are only human. Nobody’s perfect. But if you are serious about quitting spanking or other forms of physical aggression against your children there is something you can do that will help a lot. You need to learn which of your children’s behaviors get under your skin (actually you probably know that already) and why. Think of it this way: any child probably does 100 potentially annoying things a day and yet you are only bothered by a few of those behaviors. Those few actions are your personal triggers. And it is those triggers that make you vulnerable to irrational and excessive reactions. Robbyn: Yes, generally I am pretty tolerant. But if I am triggered, I can feel hurt over small slights. My anger styles are avoidant anger and shame-based anger. So, for example, if I feel that my daughter is being harsh, it can really upset me. I don’t want to feel angry, but find that I become sensitive to criticism even if my daughter insists she is not criticizing me or being harsh. Then she feels defensive, and becomes irritable and harsh. We both know this pattern very well! 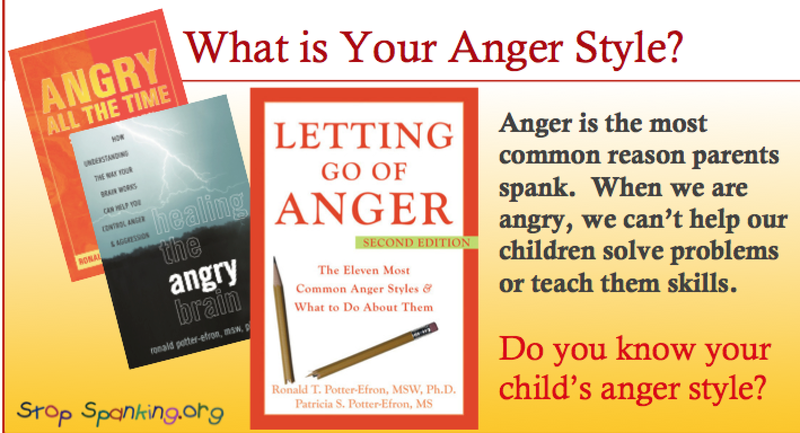 It is helpful to know your style and the anger style of your children. Sneaky Anger also known as passive aggression, in which people show their unhappiness and anger by not doing what others (especially authority figures like parents) want them to do. 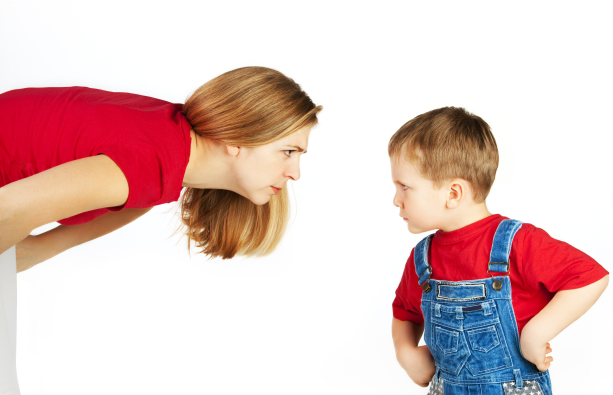 Children, because they lack much real power in most families, are experts at sneaky anger. They stall around. They forget but only stuff that matters to you. My emphasis here is how you, the parent, might react to a child who demonstrates one or more of these particular styles. Let me use the anger styles I noted above to give three short examples. If you choose the latter, you’ve found one of your anger triggers. You probably feel somehow betrayed by your child, kind of as if you’d been kicked in the gut. That’s why your reaction is too strong. SHAME-BASED ANGER Sheila criticizes your cooking. Worse, she compares you negatively with her grandmother. This hits a raw nerve. Maybe all your life people have told you what a wonderful cook she is and implied (to you) that you’re not quite as good as her. Perhaps you wonder deep down inside if you are even good enough to be a mother. “I’m not good enough” is a powerful shame message, perhaps the most common one in American society. Now probably Sheila doesn’t know any of this. She just doesn’t like your spaghetti. It’s your underlying insecurity that turns her comment into what feels like a mean-spirited attack. SNEAKY ANGER Jessica, our 4 year old, is utilizing one of her best skills – dawdling — to assert her developing sense of self. She can’t say out loud that, thank you very much, but she would prefer not to go to pre-school today. She knows you won’t give in. So she shows you she’s angry through passive aggression. Now all kids do this sometimes because going slow works pretty well not in getting what you want but in demonstrating one’s wished for independence. Again, the question is how do you react? Is it “Yep, she’s dragging her feet again. Good thing I added a few minutes to my schedule so I won’t be late” or “She’s doing it again! She’s making me late. She’ll get in trouble. I’ll get in trouble. I can’t let this happen. I’ve got to get her out of the house NOW!” Sneaky anger often triggers both anger and anxiety in the already overburdened parent struggling to stay on schedule. Robbyn: Let’s say that I am aware of my anger triggers. Now what? Dr. Efron: Fortunately each trigger can be alleviated with a combination of knowledge and consistent effort. FIRST take a step back in time and ask yourself how it is that you are so vulnerable to this kind of behavior from your child. This information will help you find out why you react so strongly to these provocations. NEXT make a commitment to yourself to step away from the past. No matter what happened to make you “trigger-happy,” this is the day to put down your pistol. Just because something has triggered your anger up to now does not mean it must continue to do so. THIRD decide what new thoughts or actions you can take instead of getting so angry about those behaviors. For example, Sheila’s mom might learn to take a few deep breaths as her daughter dawdles, remind herself that getting to the school exactly on time isn’t a matter of life and death, and even consider what might be done to help Sheila enjoy pre-school more. FOURTH practice, practice, practice. Don’t be discouraged if the old thoughts and feelings take over once in a while. But set your goals to be triggered less often, to react less intensely, and to do less damage. You don’t have to spank your kids. You do need to understand what triggers your anger so you can change how you feel, what you think, and how you act. Robbyn: Thank you Dr. Efron so much for this interview and for this amazing book. I am aware that you have other more recent books, including “Angry All the Time,” and your most recent “Healing the Angry Brain.” I look forward to reading about healing the brain, because I am interested to learn how those of us who have been exposed to high levels of early adversity can rewire our brains. We know that adverse childhood experiences can wire our brains to interpret benign situations as threatening, which makes it so much harder to parent compassionately and so much easier to be angry. And of course, anger cuts us off from the part of our brain that can be empathic, which is dangerous for our children. I know your work will be very helpful to parents, because we all want to do our best for our children. Thank you so much!